West Indian manatees are large, gray aquatic mammals with bodies that taper to a flat, paddle-shaped tail. They have two forelimbs, called flippers, with three to four nails on each flipper. Their head and face are wrinkled with whiskers on the snout. The manatee’s closest relatives are the elephant and the hyrax (a small, gopher-sized mammal). Manatees are believed to have evolved from a wading, plant-eating animal. The West Indian manatee is related to the West African manatee, the Amazonian manatee, the dugong, and Steller’s sea cow, which was hunted to extinction in 1768. The average adult manatee is about 10 feet long and weighs between 800 and 1,200 pounds. Manatees can be found in shallow, slow-moving rivers, estuaries, saltwater bays, canals, and coastal areas — particularly where seagrass beds or freshwater vegetation flourish. Manatees are a migratory species. Within the United States, they are concentrated in Florida in the winter. In summer months, they can be found as far west as Texas and as far north as Massachusetts, but summer sightings in Alabama, Georgia and South Carolina are more common. West Indian manatees can also be found in the coastal and inland waterways of Central America and along the northern coast of South America, although distribution in these areas may be discontinuous. Manatees are gentle and slow-moving animals. Most of their time is spent eating, resting, and traveling. Manatee are mostly herbivorous, however small fish and invertebrates can sometimes be ingested along with a manatee’s normal vegetation diet. They eat aquatic plants and can consume floating, emergent, and submerged vegetation from freshwater, brackish, and saltwater environments. Because they are mammals, they must surface to breathe air. They may rest submerged at the bottom or just below the surface of the water, coming up to breathe on an average of every three to five minutes. When manatees are using a great deal of energy, they may surface to breathe as often as every 30 seconds. When resting, manatees have been known to stay submerged for up to 20 minutes. Manatees can swim up to 20 miles per hour in short bursts, but they usually only swim about three to five miles per hour. West Indian manatees have no natural enemies, and it is believed they can live 60 years or more. As with all wild animal populations, a certain percentage of manatee mortality is attributed to natural causes of death such as cold stress, gastrointestinal disease, pneumonia, and other diseases. A high number of additional fatalities are from human-related causes. Most human-related manatee fatalities occur from collisions with watercraft. Other causes of human-related manatee mortality include being crushed and/or drowned in canal locks and flood control structures; ingestion of fish hooks, litter, and monofilament line; and entanglement in crab trap lines. Ultimately, loss of habitat is the most serious threat facing manatees in the United States today. There is a minimum population count of 5,733 manatees as of January/February 2019, according to the most recent synoptic survey. The reproductive rate for manatees is low. Manatees are not sexually mature until they are about five years old. It is believed that one calf is born every two to five years, and twins are rare. The gestation period is about a year. Mothers nurse their young for one to two years, during which time a calf remains dependent on its mother. West Indian manatees in the United States are protected under federal law by the Marine Mammal Protection Act of 1972, and the Endangered Species Act of 1973, which make it illegal to harass, hunt, capture, or kill any marine mammal. 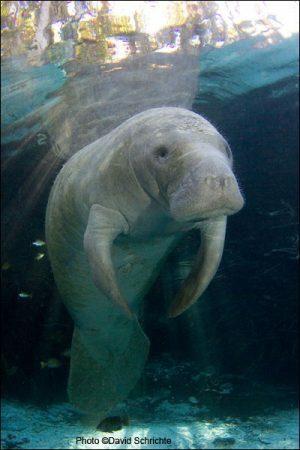 West Indian manatees are also protected by the Florida Manatee Sanctuary Act of 1978. Violations of these federal or state laws can be met with civil or criminal convictions associated with monetary fines and/or imprisonment. 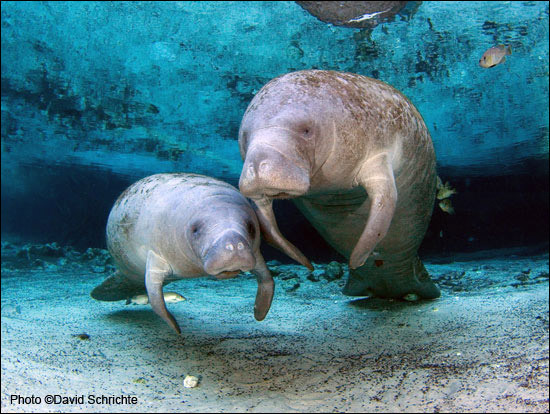 The Florida Manatee Recovery Plan was developed as a result of the Endangered Species Act and is coordinated by the U.S. Fish & Wildlife Service (FWS). In October of 1989, Florida’s Governor and Cabinet directed the state’s wildlife agency to work with 13 “key” manatee counties in Florida to reduce injuries and deaths. These 13 counties were: Brevard, Broward, Citrus, Collier, Dade, Duval, Indian River, Lee, Martin, Palm Beach, St. Lucie, Sarasota, and Volusia. Over the years, these 13 county governments have worked with the state to develop site-specific boat speed zones to reduce the likelihood of watercraft collisions and to implement comprehensive manatee protection plans (MPP) for each county. Other conservation measures deemed important to saving manatees include: research addressing biology, mortality, population and distribution, behavior, and habitat of manatees; implementation of management plans; posting of regulatory speed signs and levying of fines for excess speeds in designated areas; manatee education and public awareness programs; and public acquisition of critical habitat and creation of sanctuaries. Save the Manatee Club’s mission is to protect manatees and their aquatic habitat for future generations. To achieve this mission, we work to: increase public awareness and education; sponsor manatee research, rescue, rehabilitation, and release efforts; and advocate for strong protection measures, such as boat speed zones and sanctuaries. SMC also supports research and conservation efforts for other sirenian species around the world. Adopt-A-Manatee® and help support manatee protection efforts.